What does Hanukkah have to do with the Messiah? What does Hanukkah have to with someone who follows Jesus? It is a Jewish holiday commemorating the rededication of the Second Temple in Jerusalem at the time of the Maccabean Revolt against the Seleucid Empire. Not to mention the Feast of Dedication is the background of John 10. Also, with the exception of 1 Peter 2: 24-25, the New Testament passages that quote Isa. 53 don’t address the atoning significance of the Servant’s suffering. However, we do see Jesus is a Passover sacrifice (e.g, Jn. 19:14;1 Cor. 5:7-8); an unblemished sacrifice (1 Pet.1:19; 2 Cor. 5:21; Heb. 7: 26-28; 9:14; 1 Pet. 2:21-25); a sin offering (Rom 8:3; 2 Cor. 5:21) and a covenant sacrifice (e.g., Mk. 14:24; 1 Cor. 11:25). Many scholars have asked what might of led to the acceptance of a Suffering Messiah. As I just said, Hanukkah is a Jewish holiday commemorating the rededication of the Second Temple in Jerusalem at the time of the Maccabean Revolt against the Seleucid Empire. One can observe atoning features about the Maccabean martyrs. 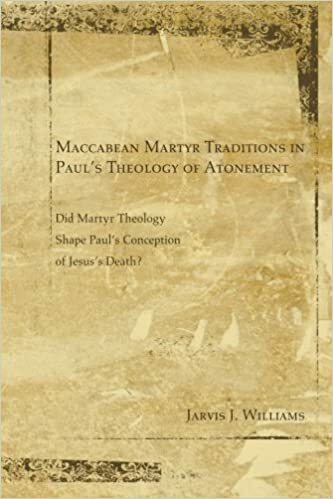 Note: this info is adapted from J. J. William’s book, Maccabean Martyr Traditions in Paul’s Theology of Atonement: Did Martyr Theology Shape Paul’s Conception of Jesus’s Death? The books of 2 and 4 Maccabees record that God judged the Jews through Antiochus Epiphanes IV because of the nation’s religious apostasy (cf. 1 Maccabees 1; 2 Macc 7:32). God poured out his wrath against Israel through the invasion of Antiochus because of its disobedience to the Torah prior to 4 Macc 17:21–22 (1 Macc 1:1–63; 2 Macc 5:1–7:38; 4 Macc 4:15–6:29). 4 Macc 6:28–29 states that Eleazar offers his “blood” to be a “ransom” so that God would “be satisfied.” A passage in 4 Macc 17:21–22 states that the Jewish martyrs die a propitiatory death for the nation. The martyrs die as penal sacrifices of atonement for the nation’s sins because the fundamental reason behind their deaths was Israel’s disobedience to Torah, and they died to end God’s judgment against the nation’s sin and to save the nation from his wrath (2 Macc 7:32–38; 4 Macc 6:28–29; 17:21–22). 4 Macc. 6:27–29: Eleazar (one of the Jewish martyrs who died for the nation) asked God to use his blood to be a ransom so that he would be the means by which he purified, provided mercy for, and to be the means by which he would satisfy his wrath against the nation. The author interprets the significance of the martyrs’ deaths in 4 Macc. 17:21–22 by stating that they purified the homeland, that they served as a ransom for the nation, and that their propitiatory deaths saved the nation. 1.The martyrs suffered and died because of sin (2 Macc 7:18, 32; 12:39–42; 4 Macc 4:21; 17:21–22; cf. Lev 1:1–7:6; 8:18–21; 16:3–24). 2. The martyrs’ blood was the required price for the nation’s salvation (2 Macc 7:32–38; 4 Macc 6:28–29; 7:8; 17:21–22). 3.The martyrs’ deaths ended God’s wrath against the nation (1 Macc 1:1–64; 2 Macc 7:32–38; 8:5; 4 Macc 17:21–22). 4. The martyrs’ deaths provided purification and cleansing for the nation (4 Macc 6:28–29; 17:22; cf. Lev 16:16, 30; Isa 53:10). 5. The martyrs’ deaths spared the nation from suffering the penalty for their own sin in the eschaton (2 Macc 5:1–8:5; cf. 2 Macc 7:1–14). 6. The martyrs died vicariously for the nation (2 Macc 7:18, 32; 4 Macc 4:21; 17:21–22). After seeing these texts, it is fairly evident there are some parallels between the Maccabean martyrs and the life of Jesus.